The cloud storage is becoming extremely popular and is pretty useful to store our data on network and keep it safe. The advantage being that it acts as a backup as well as can be accessed from anywhere. Because of the above reasons, many service providers are now investing in providing cloud drive and storage space for its users. E-commerce company Amazon has recently firmed its grip in the cloud storage competition by announcing two affordable unlimited storage plans – Unlimited Photos and Unlimited Everything. The Amazon Cloud Drive is an online data storing service that allows to store 5 GB of data for free. For storing more amount of data, you will need a prime membership. The Amazon prime membership offers unlimited storage at an yearly rate of $99. This amount may seem to be quite huge for those who want only certain kind of data to be stored. For this purpose, the company launched the additional plans at an affordable rate. The Unlimited Photos Plan from Amazon will let you store an unlimited number of photos in Cloud storage space. You can upload existing photos to free up room on your devices and then set up Cloud Drive to store any photos you take in the future. A 5 GB of additional storage is available for videos, documents and other files. 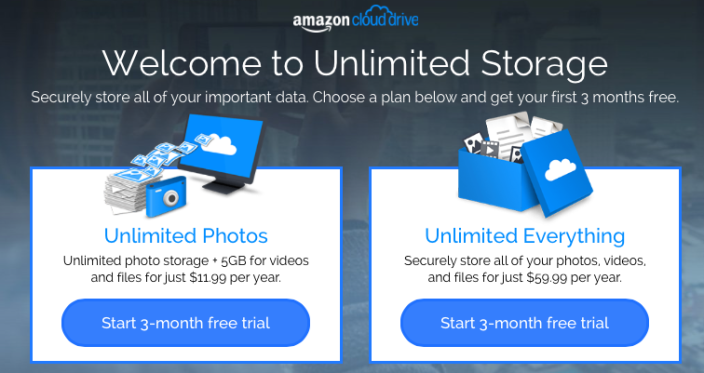 The Unlimited Everything Plan from Amazon will let you store anything you want like new and existing photos, videos, files, documents, movies, and music in Cloud Drive .There is no limit to the data stored. The Unlimited Photos plan is available for $11.99 per year and there is a 3 month trial period. The prime members have to pay no additional charge. The Unlimited Everything plan is available for $59.99 and there is a 3 month trial period. There is no discount for prime members in this plan. We can access these data from any device be it a smartphone, tablet or PC. Amazon is only the second company to Microsoft currently offering unlimited storage space. The service from Amazon is cheaper than its other competitors like iCloud, Google Drive and Dropbox. The difference in service is that Amazon does not have an integration for its service and also there is no automatic sync available for the desktop application of Amazon Cloud Storage. Despite this, there is no doubt that users can get to store all their data safely and affordably at one convenient space online.